Although this may seem like a silly question with an obvious answer of “high value”, we have found that asking this and determining why you were considering a pool in the first place, helps homeowners quickly decide if a pool is the right choice for them. What is the VALUE of a swimming pool? Value can be determined in many ways, but we have found that our customers, we like to consider them the Aquamarine Pools family, have had several things in common. They want to create a vacation in the backyard in order to entertain family and friends, they want add resell value to the home, and they want to have a swimming pool that won’t cost a fortune to build and maintain. According to Realtor.com, adding an inground swimming pool can increase your home’s value by as much as 7%. The old complaint that pools cost a lot of time and money to maintain is no longer true. With innovations in swimming pool technology like fiberglass pool construction, hi-flow pumps, and salt sanitization, the right pool requires minimal maintenance. When we receive photos from our Aquamarine Pools family, we see children, parents, grandparents, aunts, uncles, cousins and more enjoying their pool. Most build a pool to enjoy family time in the backyard both in and around the swimming pool. This is of high value to most, and having a pool as the central point to gather, makes it a fun and eventful way to spend time together. Sometimes the Texas heat can be overwhelming and is ranked the second warmest U.S. state! That is why having an inground swimming pool is the perfect way to cool off, with the added benefit of entertaining at the same time. 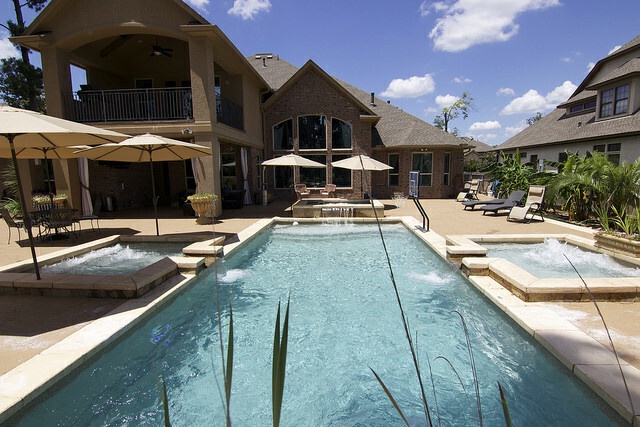 Invite friends and neighbors over for a poolside cookout or a dip in the water. Swimming is a great recreational activity for people of all ages. Our pools provide the perfect size options to suit both recreational swimming and more vigorous lap training. Water aerobics and pool cycling/spin also provides a low impact training option. There is nothing better than relaxing near a luxurious pool, listening to the sounds of running water and enjoying the sun’s rays. The weather is beautiful and you don’t have a care in the world, you’re in paradise. No this is not a tropical resort, it’s your backyard! In your backyard oasis you can relax in and around the water, grill your favorite food, sip your favorite drink, and invite who you want to join you! The best part is you do this without having to book a flight or hotel room. So now when you ask yourself if a pool is worth it, think about the VALUE of owning the backyard of your dreams!